SFBall 23 weekend had a few surprises in store for the comic book creators of Blood & Valour, a new medieval fantasy series. 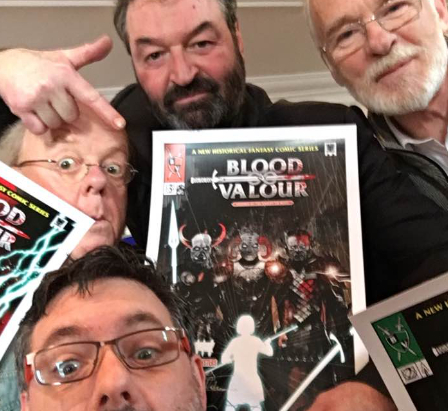 Blood and Valour, a new Graphic Novel developed by artist Marcus Pullen from Blue Donut Studios, writer Matt Beams and poster/cover artist from Shogun Studios were attending the SFBall23 for the launch of the new 128 page four volume graphic novel. The project which is the brain child of Dr Cheryl Butler, head of culture at Eastleigh Borough Council, has been six months of intense researching, writing, drawing and is now preparing to be printed and shipped. As part of the launch the team had a stand at the much revered charity science fiction event that has been running for 23 years and is supporting the Teenage Cancer Trust. Blood & Valour was well received and had a number of pre-orders both at the show and online over the weekend. None of the the team were expecting some surprise celebrity visits from Ian Beattie, Roger Ashton-Griffiths and Ian Mcelhinney who after an incredible talk about life on Game of Thornes and being an actor came up to spend time with the team to find out more and provide their amazing support. If that wasn’t enough, the legendary Tony Malloy was very pleased to receive his crew t-shirt. Senior Art Director and Concept artist Dave Freeman (Star Trek: Beyond, Terminator Genisys, Thor: The Dark World, The Hunger Games: Mockingjay Part 2 ) took time out of his talks to give his support for the project and his encouragement to the two artists.